On behalf of the Society of Chinese Bioscientists in America (SCBA), the Chinese American Hematologist and Oncologist Network (CAHON), and the Chinese Biological Investigators Society (CBIS), we write to express our concerns about the recent political rhetoric and policies that single out students and scholars of Chinese descent working in the United States as threats to U.S. national interests [e.g., (1) and pp. 6–7 in (2)]. These developments have led to confusion, fear, and frustration among these highly dedicated professionals, who are in danger of being singled out for scape-goating, stereotyping, and racial profiling. U.S. policies must avoid targeting, as Representative Judy Chu (D–California) put it, “an entire ethnic group of people for suspicion that they're spies for China” (3). Existing U.S. laws are in place to safeguard America's interests and to punish perpetrators for stealing trade secrets or engaging in illegal activities. We absolutely support the well-established policies regarding intellectual property, employment, and governance of conflicts of interest. Such policies have been further enhanced in recent years with more detailed and specific requirements from various federal and state agencies, including the National Institutes of Health (NIH) (4). The vast majority of scientists and students of Chinese descent are law-abiding citizens, residents, or visitors who have followed these rules. Open data access and data sharing are important for accelerating research advancement and can be implemented without putting U.S. security at risk. NIH has espoused such policies for years (5). Most Chinese-American scientists believe that biomedical research benefits all mankind and that multinational collaborations accelerate scientific progress and discovery. However, some NIH recommendations could target collaborations if implemented with bias. For example, NIH recommends fostering “trusted relationships” [p. 12 in (2)] with foreign partners but does not specify whether the trust must be established through official channels. NIH also suggests more disclosure requirements for foreign collaborators than domestic colleagues (pp. 12–13 in (2)], which could hinder collaborations. 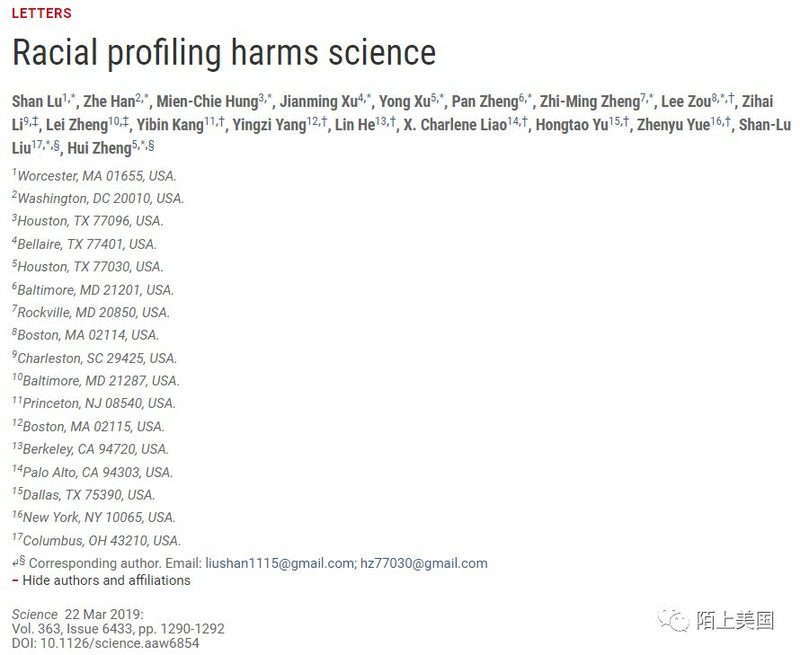 In recent decades, there have been several high-profile cases in which Chinese-American scientists were wrongfully accused of spying [e.g., (6–10)]. Although all charges were eventually dropped and/or the individuals legally exonerated, the lawsuits have had not only devastating effects on the careers of these individuals but also a chilling and negative impact on the Chinese-American scientific community at large. It has also become increasingly difficult for Chinese students and scholars to obtain visas to enter the United States for scientific meetings, visits, and research opportunities (3). It is our sincere hope that these actions, which we believe amount to racial profiling, will stop immediately and that increased security measures will not be used to tarnish law-abiding scientists and limit normal and productive scientific exchanges. We thus urge both federal and local governments to work with our academic and research institutions to create a respectful, transparent, and productive environment for everyone, regardless of their ethnic origin. We also hope that scientific collaborations and exchanges between the United States and foreign academic communities will be strengthened rather than suppressed. American scientific advances and technological innovations are the result of global efforts, and their future depends on the continuation of time-tested traditions of openness and cooperation on the global stage. The views expressed in this Letter are solely those of the authors and the three organizations, not the affiliated institutions of the authors. GMT+8, 2019-4-25 05:00 , Processed in 0.028873 second(s), 8 queries , Apc On.